With the holidays just around the corner, here’s a delicious way to get a head start on your holiday baking. These cookies are loaded with festive flavors and are a breeze to make; they also freeze well. Hmm . . . why not do yourself a favor and fill your freezer now with yummy cookies for all the upcoming parties, Thanksgiving, Christmas, neighborhood get togethers, the annual cookie exchange, gift giving . . . just think about how many events you have coming up! This recipe makes plenty to share. You’ll get about 4 dozen large cookies (approx. 3″) or you can size them down and get lots of smaller cookies for a party or exchange (just adjust cooking time). I love the cranberry-pecan combination, but if you prefer, just swap out the cranberries for raisins. Mix butter with sugars until light and fluffy. Add eggs and vanilla. Stir together flours with salt, soda and cinnamon; add to mixture. (Note this makes a lot of thick cookie dough – you’ll want to you use your cookie paddle.) Add oats and mix until blended. By hand stir in cranberries and nuts. Refrigerate dough at least 1 hour. When ready to cook, roll dough into 1 1/2 inch balls and place on cookie sheet lined with parchment. Flatten dough balls a little with a cup. Bake at 375 degrees for 11-13 minutes or until edges are lightly browned. Makes 4 dozen large (approx. 3″) cookies. Made these this weekend – voted best oatmeal cookie ever by my family (we made with raisins). Thanks this recipe is a keeper! 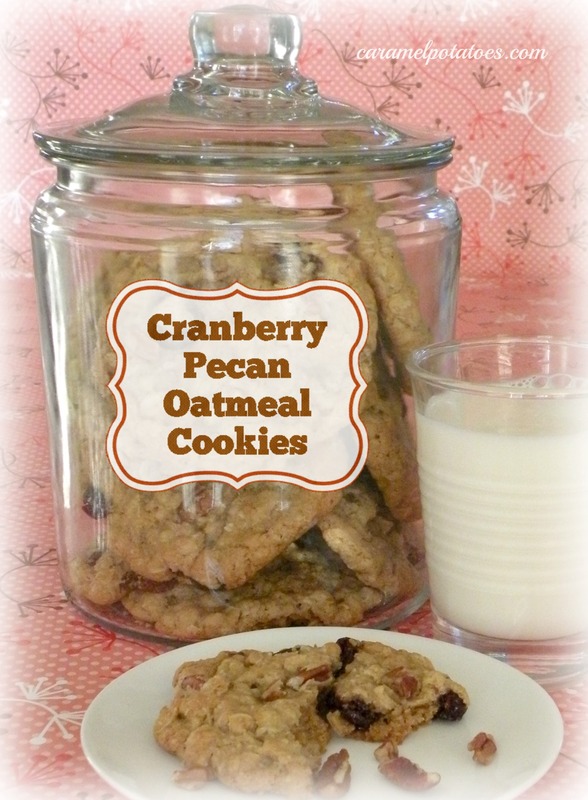 Yum- love cranberries and pecans – can’t wait to try this! I made these today. I used the exact measurements and did not substitute anything. They came out flat as pancakes and partially burnt. I added more flour and then, they turned out fine.